We get our hands on the PS4 version of LawBreakers to see how the action translates to gamepads. 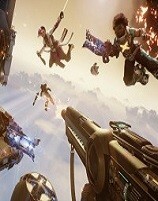 The new videos highlight the game's fast-paced, gravity-defying action. Post-release content updates will be free, too. We got some hands on time with LawBreakers, a game trying to capture the glory days of the arcadey first-person shooter. The new trailer is loaded with over-the-top action. You can also sign up for the alpha today. The natural wonder has somehow been taken over by the Yakuza following a massive change in gravity. OK then.